For most embedded projects it is good practice to have basic tooling for testing I/Os. I/O primitives such as ‘read gpio’, ‘set pwm duty cycle’, ‘read adc’, not only allow engineers to verify hardware and software drivers, it might also be very helpful to service and support people. c <0-3> pwm,<0-100>: set pwm duty cycle of channel. The green4 will answer whether the command was successful or not e.g. c:0 3 pwm,80 (i.e. channel 3 was successfully set to pwm 80). The protocol being ascii-based is a deliberate choice: ascii is human readable so the user only needs a serial terminal to communicate with the device. No additional tooling is required. A binary protocol would be more efficient though: less bytes to transfer and less parsing on target (ideally, binary data can be mapped 1-to-1 in a memory structure – beware of endianness!). As a consequence, cpu power and bandwidth is better utilized. At this moment communication speed is configured as 9600 baud which is slow but reliable (less chance of hardware errors). We are planning to extend the serial commands with an optional CRC. 3 supplementary channels e.g. for fan, external device etc. Also, it is possible to connect channels to each other by making groups (in the picture, channel 3 and 4 are each other’s complement). Not too many features: the goal is to test hardware and basic software. 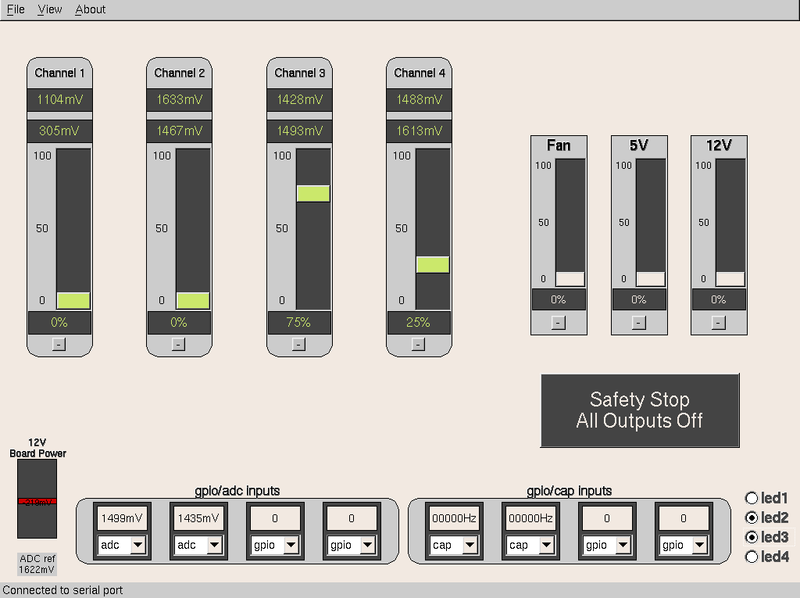 The Green4 gui runs multi-platform on Windows and Linux (and probably OSX as well). In order to achieve this, the choice of GUI framework (or toolkit) is important. There are several possibilities such as Qt, Fox toolkit, wxWidgets, juce… but we choose FLTK because it is simple, lightweight and long-lasting (we know the code will still compile 20 years from now without much effort). The windows executable is cross-compiled from Linux with mingw. ./green4: start the gui and do your thing there 🙂 No scripting. Remote telemetry is an advanced feature we support as well (with the same tool!). This will be explained in another article.